This research study, which was conducted during 2000 and 2001, examines language immersion in an urban setting. This urban context adds issues of varied ethnic backgrounds, varied socio-economic levels and potentially more diversity in learning styles and learning challenges. Granville, the first immersion program in this Midwestern city, was the school site for the research. Its early immersion program has 4K through grade 5 and a continuation immersion program at a nearby school includes grades 6 through 12. The study posed a number of questions which were addressed by both qualitative and quantitative methods. Classrooms were observed, surveys distributed to students in three different grade level categories, grades 5, 8-10, 9-12, and post high school, individual interview sessions were conducted with a representative sample of surveyed students, and finally, standardized test scores were analyzed. One of the study’s focal questions explored the impact of the language immersion schooling experience on African American students and students from economically disadvantaged backgrounds. While Canadian immersion programs have been found to exist in largely middle class schools, the schools in this study included a far more diverse student body. At the time of this study, there were 590 4K-5 students, 36.1% of which were identified as ethnic minority students, a decline from 43.4% five years earlier. Of that group, 1% was identified as either Hispanic or Native-American, and the remainder was African-American. Twenty-five percent of children qualified for free or reduced lunch, down from 29% the previous year. In the district as a whole, 61.2% were African-American, 14.2% were Hispanic, and 4.2% were Asian. Eighty percent of students qualified for free or reduced lunch. 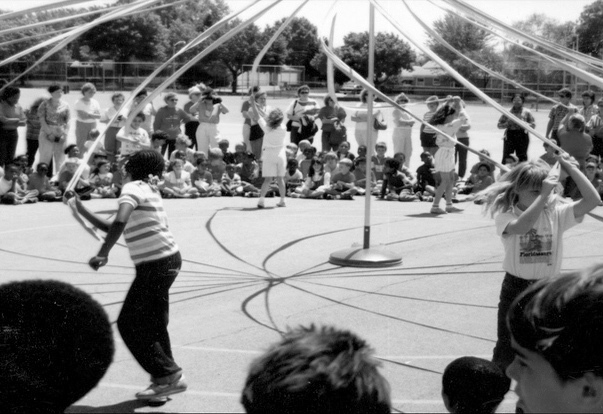 The Maibaum is part of a traditional celebration held at the time of the school’s annual Kinderfest. Students in the early total immersion program are taught to read first in the immersion language, in this case, German. English reading is introduced in the second grade for the equivalent of thirty minutes each day. It is therefore expected and confirmed by most research that some lag in English reading skill will be evident for a year or two, until the reading skills in English can be brought up to grade level (Holobow, Genesee, Lambert, Gastright, & Met, 1987; Swain, 1990). German immersion students are tested, however, in grade 3 in English reading as are all students in the district. Tables 1-2 and Graph 1 compare grade 3 reading score means over eleven consecutive years (1988-1989 – 1999-2000) for the immersion school and the school district as a whole based on the district’s required standardized assessment, Wisconsin Reading Comprehension Test (WCRT) for Grade 3. Using descriptive statistics, Table 1 shows that when mean scores are averaged across eleven years, German immersion students in Gr. 3 consistently outperformed district peers in reading, regardless of ethnic background. Table 2 displays statistical output from a 2x2 factorial ANOVA (Analysis of Variance) designed to measure the effect of two independent variables (ethnicity and school) on a dependent variable (reading score). Test results indicate a significant main effect for school and ethnicity. In other words, students from the German immersion school performed significantly higher than students who attended district schools (mean score of 92 as compared to 78) on reading scores with F(1,40)=34.48, p<.001. (A p-value of <.001 indicates a less than a 1 in 1000 chance that the differences observed were due to chance or error.) In addition, White students scored significantly higher than Non-White students1 (mean scores of 91 and 79) on reading scores (F(1,40)=28.5, p<.001). 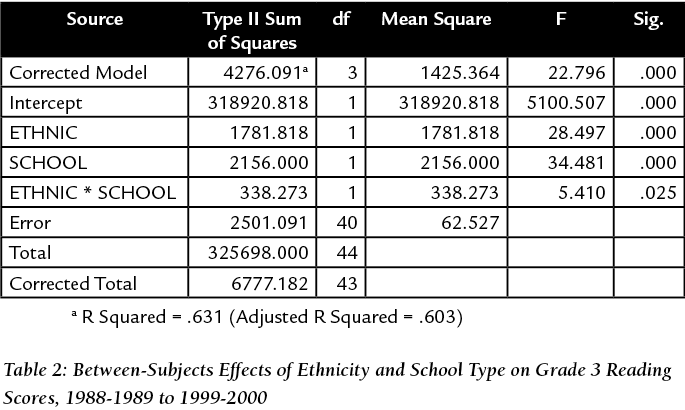 Finally, in Graph 1 results show a significant interaction between school type and ethnicity (F(1,40)=5.41, p<.025). (A p-value of <.025 indicates a less than 2.5 in 100 chance that the differences observed were due to chance or error.) 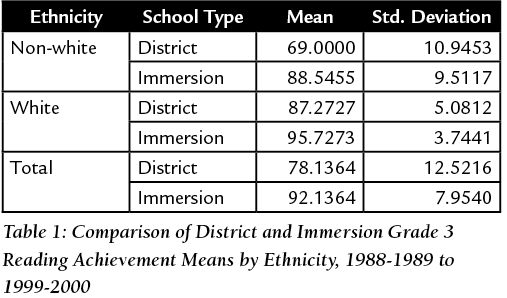 This finding may suggest that in the immersion program a student’s ethnic background is not as big a factor in determining reading performance as that found in district schools as a whole. That is to say, participation in the German immersion school seemed to narrow the oft-seen gap between White and Non-White students. In sum, early total foreign language immersion did not appear to have a negative effect on the reading achievement of White or Non-White students. Both student groups outperformed district averages. 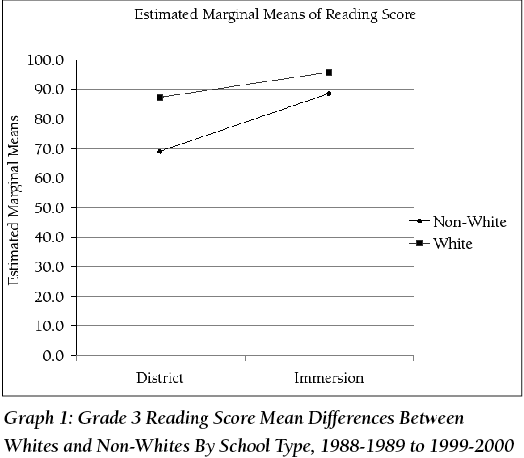 Furthermore, the reading performance gap between.White and Non-White students was smaller for immersion students relative to district performance as a whole. Because a substantial number of students in my surveys and interviews questioned the negative impact that immersion may have had on their math ability, I compared the standardized test results for math over three school years. Math is almost exclusively taught in the target language, since program designers hypothesize that math content is less language-dependent, and therefore, lends itself well to instruction in a new language. I was never strong in math and it was harder for me to learn in German. And then um, but it was only because I had weaker math skills anyway, and I still do to this day. And it did make it a little more difficult for me to turn around… see, I don’t blame the language on it at all, I do have weak skills and I mean somebody with stronger skills probably wouldn’t have had a problem with it at all. (Sarah, age 25, White). Because some students felt that foreign language immersion must have had a negative impact on their English language ability, I decided to examine the results of the state’s standardized tests for English language arts over the same three years. The following table also compares percentages of students at or above the state proficiency standard at school, district and state levels, disaggregated by ethnicity and socio-economic status. While early immersion students’ test performance seems to indicate that such a schooling experience is appropriate for a diverse range of children, one student shared his doubt based on his family’s experience. The students most often expressed their feelings of belonging to a privileged group, a unique learning community. Some said it was a wonderful topic to bring up in a job interview since it usually captivated the interviewer’s attention. The eighteen interviewees between the ages of 10 and 25 spoke with fondness about their experience in the German immersion program. They shared their specific memories, many of which had something to do with the rich cultural experiences offered by the school. They also expressed appreciation for the unique schooling opportunity and valued their acquisition of a second language. The immersion experience served to unite the diverse student body with their unique experience. They had high levels of confidence in their ability to appreciate both language and culture. In some sense they realized that they were part of a special cultural and linguistic experience, which in turn made them special. Sarah expressed an important aspect of this specialness and at the same time offered a compelling rationale for making the program available to children of all groups. The term “Non-White” is used in reporting these data, because there was one Hispanic child in that group and separating the scores by ethnic group jeopardizes the privacy of that student.